A Tennessee waiter said he got a surprise “tip” from a couple he served who were not fond of white people. Nathan Bergeron, who works at the On The Border Mexican Grill & Cantina, claimed that a couple left him a $0.00 tip with a note explaining why they didn’t give him a gratuity. 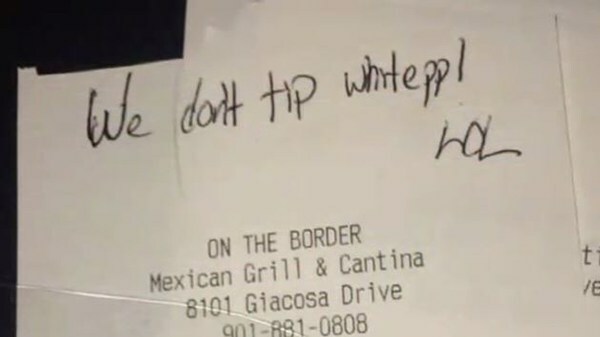 “We don’t tip white ppl! LOL,” read the note at the top of the couple’s $47.00 bill on Sunday, NBC4 reported. According to his friend, Brandy Sciara, who shared a picture of the note on her Facebook page, Bergeron depends on those tips and lives in his car outside of the restaurant. But as it happens, it may be the greatest tip Bergeron has ever received. Since the story made news, a GoFundMe page for Bergeron has made more than $6,800, of a $500 goal. The waiter has taken it all in stride. The restaurant he works for also issued a statement of support. “We’re always going to take care of our employees and have their back,” the company said. In this day and age, people have been known to fake victimhood. There is reason to take a deep breath and consider the possibility that it was a publicity stunt. After all, we've seen black people spray paint the 'N' word on other black owned homes, Jewish people who have called in anti-Semitic threats to Jewish community organizations, so it is not unreasonable to suspect it could be a white person getting his 15 minutes of fame by faking a scribbled note. I'll believe it when the perp is identified. How do you tip with an EBT card LOL. How many of these stories where the wait staff get a disparaging comment written on the receipt in lieu of tip, actually turn out to be true? Al Sharpton and Jese Jackoff will be there protesting in 1......2.....3 ........ 4 ...... hmmmmmm silence from the race pimps. NOTE who fakes victimhood ..... the professional victims. You would have to be a very brave or very stupid Black person to eat at that restaurant after this. What servers and cooks can do to food is really amazing. But if you are Black and like living dangerously, be my guest. What if the waiter said "We don't serve (fill in the blank)". You mean sneezing or spitting snot on their food? Maybe a special creamy white salad dressing? Maybe an "S" word sandwich? All served with a glass of fresh urine? If there is no 'victim', there is no lawyer. How many blacks know the word 'don't' with the correct punctuation ? its not racist. they are just stating a fact. they want to blame whitey for their shortcomings. they are wrong but it is what it is. Yet another reason to simply stay home and learn to make great meals and entertain at home. True. Black people can't write so it couldn't have been a black person. The ones that do know it probably would have had good manners and also tipped.